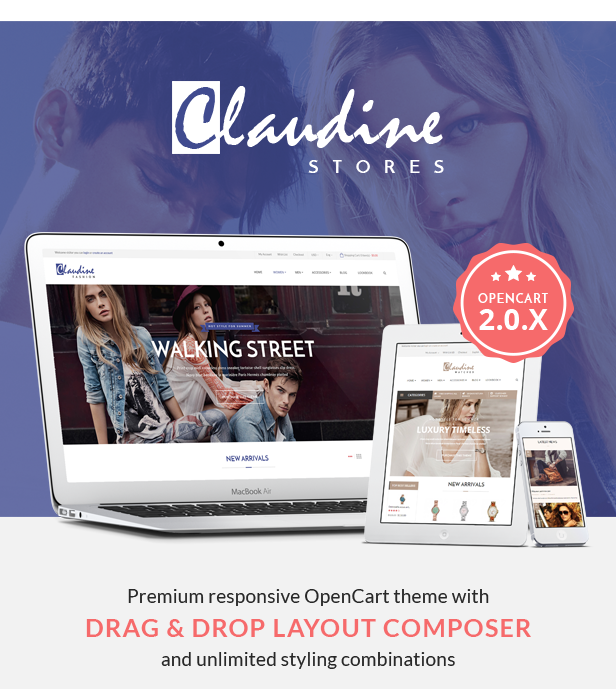 CLAUDINE â€“ Drag & Drop Responsive OpenCart Theme is built on opencart platform that facilitates user to drag and drop in layout composer feature. It can store great number of products in various styles of Mega Menu and displays conveniently with new modules such as revolution slider, quickshop, quick select by alphabet, category, flickr, blog and feature products. 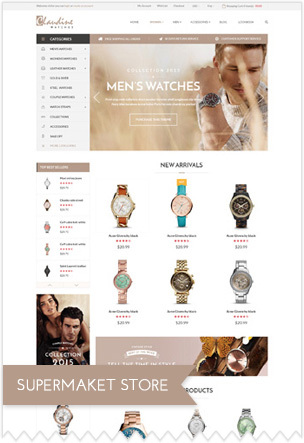 Jewelry Comohos theme will keep your customers clicking on your store endlessly. What you are looking for to equip your business online is now available in this theme. Homepage with mega menu, full-with slider and customizable static blocs are displayed neatly and attractively so that jewels are arranged in the catchiest manner. With friendly-user layout composer in back-end, you can customize this theme without any anxiety of advanced technological knowledge. Other features to support product management and transaction are check-out page, payment gateways boss blog module and so on. 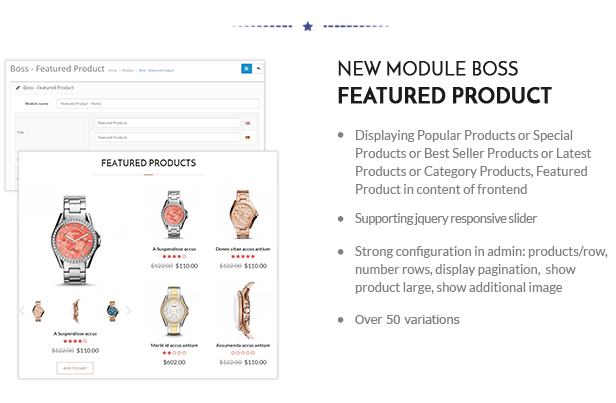 See more features in jewelry theme demo. Are you ready for an eCommerce theme to push up the store for those in love with bakery? Bakery Store Responsive OpenCart Theme - Cohomos will provide you with variety of features to shown products in clear and eye-catching manner such as mega menu, full-width sliderbar, one-page checkout, product filter, product review, product comment, quickshop, different language and currency. You can modify them in back-end easily with user guide provided in this theme. Endless enjoyment with Bakery Store of Comohos. Bossthemes TopWear a Responsive OpenCart Themes developed by BossThemes.com. Built with a custom theme settings let you edit fonts, colors, background easily. A lot of modules are built-in and free of use. Letâ€™s check out features below. 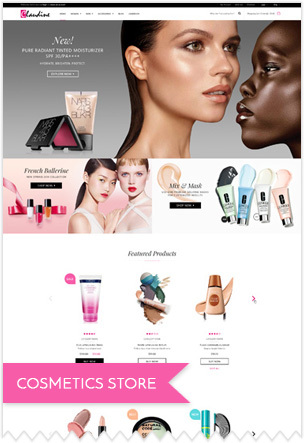 As the most modern, friendly and luxury style, Claudine Beauty Store Responsive OpenCart ThemeÂ is an amazing Opencart theme suitable for selling cosmetics, beauty equipment, fashion, spaâ€™s product or any business. 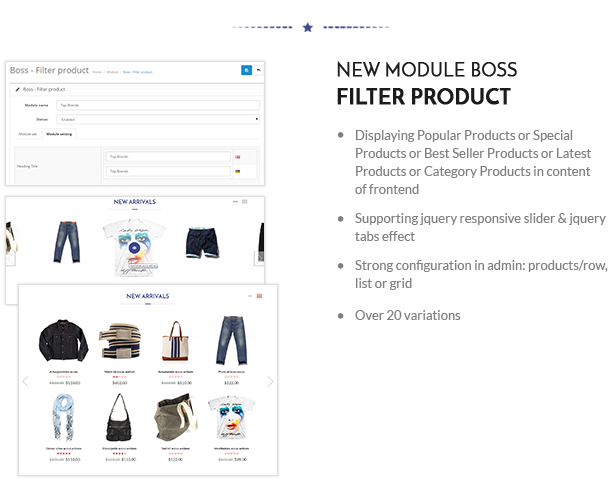 You can create unlimited layout and unique design with many advanced elements such as Slidershow, mega menu, static blocs of products or categories. Besides, the theme also appears greatly on different screen revolutions and browsers. Moreover, Opencart also allows you to localize your store for different countries with correlative currencies and languages. Letâ€™s experience this awesome beauty store theme and explore more features in demo. Hard to find an eCommerce theme to sell appliances and other devices but Appliance Store Comohos will bring you the optimal solution. Beautiful mages in slider module absolutely give visitors overwhelming impression at the first glance along with many functions to bring customers the great convenience of shopping. Your customers can enjoy purchasing by advanced features such as product filter, zoom to product, different payment modes and one-page checkout. Not require much understanding in code to customize your store, friendly composer for end-user will help you solve all. 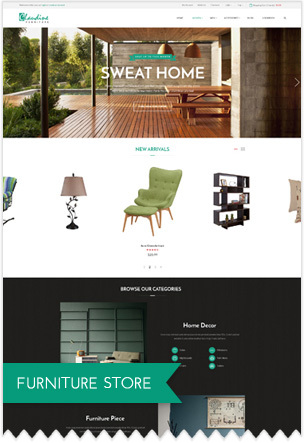 Experience the demo of Appliance Store Responsive OpenCart Theme - Comohos here. Claudine Cosmetics is well matching for any business owners to open eCommerce websites for cosmetics, fashion and beauty equipment with trendy design. The theme is fully responsive theme working perfect on all kind of resolutions as well for mobile, tablet, desktop having medium and large screen. The layout of this theme is neat and clean with many effects only by hovering. Powered by the framework, the theme supports you many great tools to customize theme via using Visual Composer, mega menu, slidershow and unlimited colors, styles and fonts. So great to work with Claudine Cosmetics. As you are here, you are definitely looking for a new layout for your online store of digital equipment. And, the brand new design, Responsive OpenCart Template â€“Bossthemes Digiworld, will be your best choice.Â Letâ€™s experience the demo, you will be impressed by a neat, clean and smartly organized layout comes along with the most powerful features in Bossthemes Responsive Digiworld. Your online store will be beautifully in all customerâ€™s devices because DigiWorld is responsive. Moreover, the theme is featured with the new slideshow which is unlimited in caption layers, number of slide and dimension. Together with Boss Zoom andQuickshop, Bossthemes Digiworld makes sure your visitors have a good time shopping and likely to come back often.Â Importantly, you will no longer struggling with Product Category while the new Mega Menu module is supported which means you can custom menu with many types of dropdown options. There are still many many awesome features and functions of Bossthemes Digiworldwhich you will want to get for your eCommerce business. Check it yourself!!! Never get tired even when spending hours on shopping at Shopping Mall OpenCart Theme - Comohos theme because its unique design and powerful features will enable customers to hit what they need quickly. 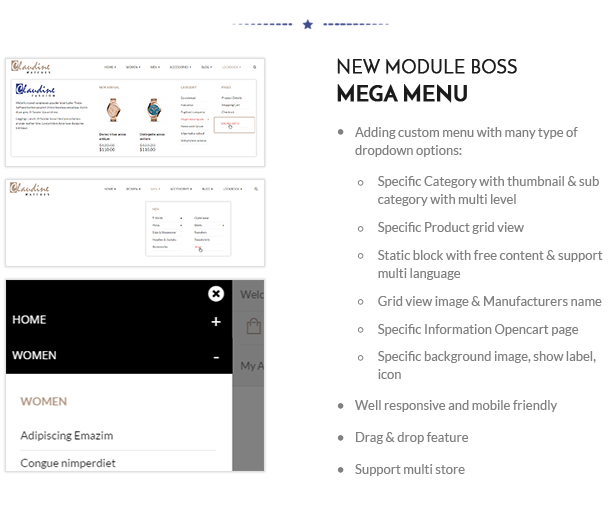 A mega menu cannot be lacked for your store online, in combination with revolution slider, featured category, friendly-user admin panel and unlimited fonts and colors. 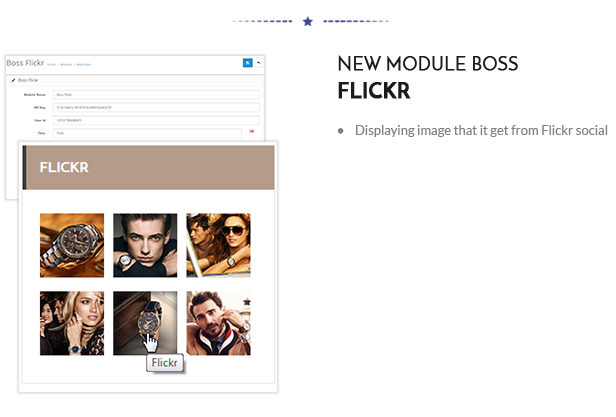 Boss blog module is also another advantage of this theme. You can find it ideal to install Shopping Mall Comohos for your store and popularize it to your customers easily. Donâ€™t wait and take it now. As Christmas is coming to town very soon, Bossthemes specially designs the newÂ Responsive Opencart Christmas template. If you are about to open a store to sell Christmas decorations, or your store are stocking up these stuff for this special time only, you both will need this design. In the white background, the familiar red color on decorations shines most brightly. Best things are shown on Responsive Christmasâ€™ revolution slideshow which is capable to display both image and caption, multi-layer and multi-effect. Ensure your sales of specials! Comohos High-TechÂ is a High-tech storeÂ responsive Opencart theme compatible for any kind of high technology devices, mobile, cellphones, camera, laptop, gps, digital accessories, gift shop, electronic equipment and all types of business. 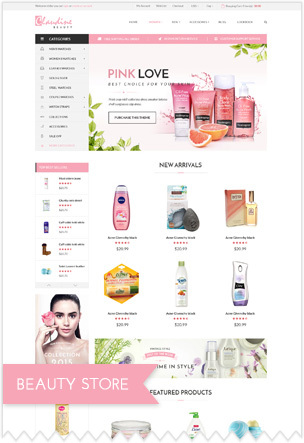 This theme is developed with new features such as slideshow, featured product slider, new product slider, dropdown shopping cart, back to top button, thumbnail images slider, blogs. At the same time, you can modify and customize the theme on your available ideas to turn it unique among competitors with support of friendly-interface admin panel. Deliver the modern and professional store with Hightech Store. Shopping and Daily deals Comohos is Opencart theme designed to meet customer demand of saving time on shopping online and offer them the comfort of browsing. With the clean, neat and vivid layout along with catchy colors, absolutely Shopping and Daily deals Comohos will attract visitors from the first sight and keep them stay in the site as long as possible. 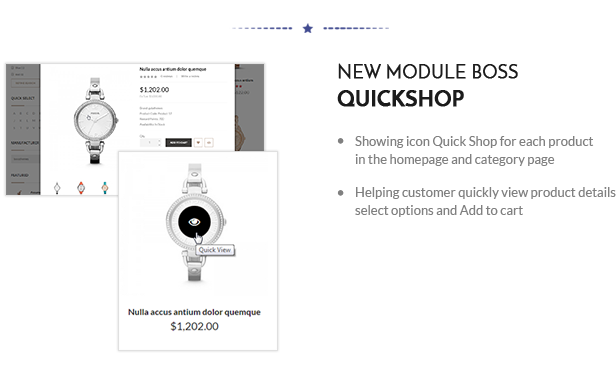 What's more, a mega menu can facilitate shoppers switch to select exactly what they need quickly. 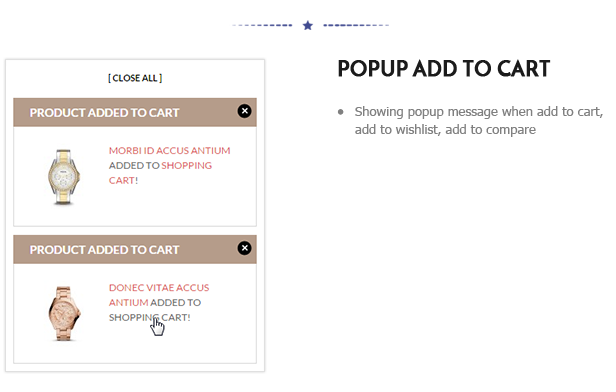 Other advanced features to display and manage products such as add-to-cart, check-out page, zoom to product and payment gates are also designed in this theme. Shopping and Daily deals responsive opencart theme is the ideal choice for stores that contains the massive number of products ordered as masterpiece. Thereâ€™s a full theme for fashionista just named Fashion Comohos where enable your fashion business to become the most trending eCommerce store. Mega menu, revolution sliderbar, and featured blocs of new arrivals, special offers and so on are arranged at catchy positions to create the balance in layout. Applying set of colors is to highlight products on luxurious and elegant background. Shopping on site of Fashion Comohos template will make shoppers feel comfortable and attracted and not tired at all in visiting many stores at one time. Install Fashion Responsive OpenCart Theme - Comohos now and discover it. Are you seeking a store to display glasses and other eyewear? Youâ€™re right at the place. Eyewear Comohos will bring you an ideal theme to serve store online. Eyewear Comohos appears impressively at the first browse by full resolution slider of beautiful and unlimited images. Right below it is mega menu and featured blocs that support you to display highlighting products in your store and other ways to show products. 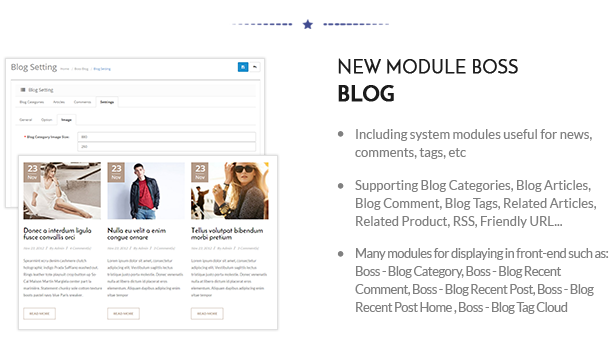 Blog module also helps to boost the effectiveness of content marketing on your shop. With easy-to-use composer, you are free to customize the theme on personal ideas. Other features are waiting for you to explore. To adapt to the latest trendy of eCommerce websites, Furniture Comohos is built up as an ultra-premium and unique design that promises users an absolute satisfaction of outstanding features integrated. 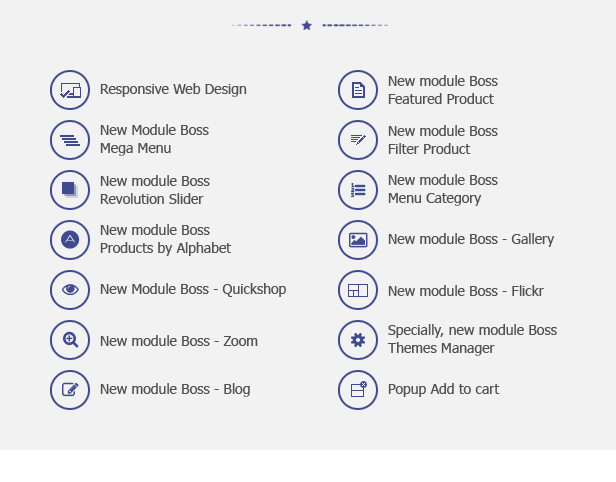 The Opencart based creation provides this theme an eye-catching appearance with reasonably designed layouts and the new module boss that offers a mega menu as well as revolution slider. Besides, it also brings shoppers the amazing blocs for featured product. On the other hand, Furniture Comohos is extremely friendly to users in terms of management and updating. More and more features are waiting for you to discover! Definitely Decor & Furniture Comohos will make your store look awesome! 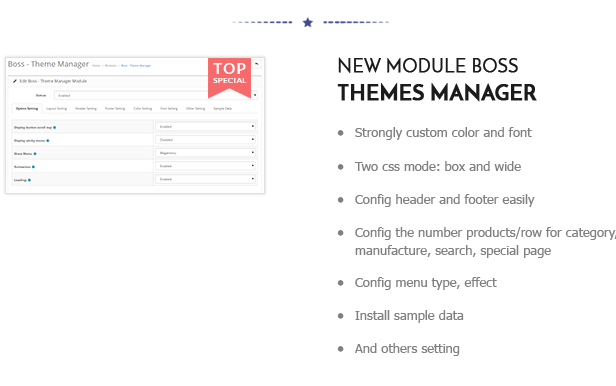 Bossthemes Electronues has features to help customize the interface your website easily without need to customize html, css. Besides Customize number of columnsÂ and Responsive function, Bossthemes Electronues is also featured with many other powerful trends. Theme Variation allows users to set some of the theme design.Â Customise color and font supports 639 fonts from google font. Multistore is available if you are interested in doing multi store. More interesting, to make your store truly satisfy for customer, Bossthemes Electronues supports Product added to wishlist and Product added to compare. Customers will never be happier elsewhere rather than your shop to look for stuff they want. Claudine Supermarket Responsive OpenCart ThemeÂ is a 100% fully responsive Opencart theme with stylish design and powerful visual composer. The clean and neat layout of Supermarket Store will allow you to use the theme for any kind of business. At the same time, the possibility to customize options for colors, styles and fonts on your own will stand out your site among competitors. This theme also brings demanding features such as drap and drop page builder, different layouts, new designs of header that enables you to adapt specific needs easily and conveniently. Brighten your business with the Supermarket theme. As for all products arranged in one theme, take a zoom to Supermarket Comohos built on Opencart platform with many surprises. Dressing up a totally new cover with the creative combination of structure and color, Supermarket Comohos impresses customers at the very first sight. A mega menu on the top site shows products categories plus other functions such as add to cart or language selection so that people can easily shop in long time at their convenience. Additionally, high resolution images shown in the sliderbar will help update latest trends for shoppers and attract their attention to programs launched at your store. Suitable for supermarket, shopping center, shopping mall, fashion mall, b2c marketplace e-commerce websites. Other powerful features are displayed in supermarket theme demo here. 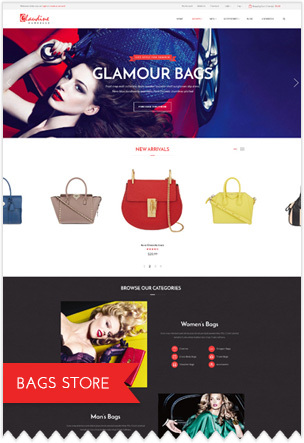 Thereâ€™s a responsive Opencart theme for fashionista of bag just named Claudine Home Bag where enables your fashion business to become the most trendy store. Mega menu, revolution sliderbar, and featured blocs of new arrivals, special offers and so on are arranged at catchy positions to create the balance in layout. You can customize colors, fonts and styles that aim to highlight products on luxurious and elegant background. Shopping on site of Claudine Home Bag template will make shoppers feel comfortable and attracted and not tired at all in visiting many stores at one time. Install Home Bag now and discover it. Creating unforgettable Opencart store for bag, clothes and fashion with Comohos Bag, that means your business is approaching the success. This theme is a fully responsive one that works perfectly on all kinds of resolutions and powered by great features such as mega menu, revolution slidershow, static blocs of product and category. On the other hand, you can take advantage of friendly-user Theme Editor with many options of styles, colors and fonts to customize theme for your own unique design. Canâ€™t wait to see new store with Comohos Bag. 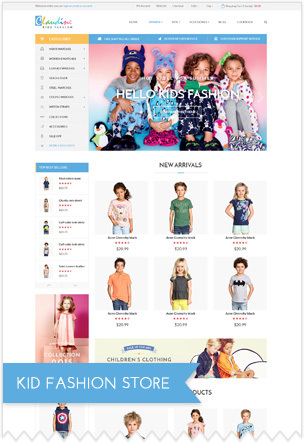 Claudine Themes - Kids Fashion Responsive OpenCart ThemeÂ as an Opencart Responsive Theme is specially designed for fashion design, kid clothes, jewellery, toys and other purpose stores. 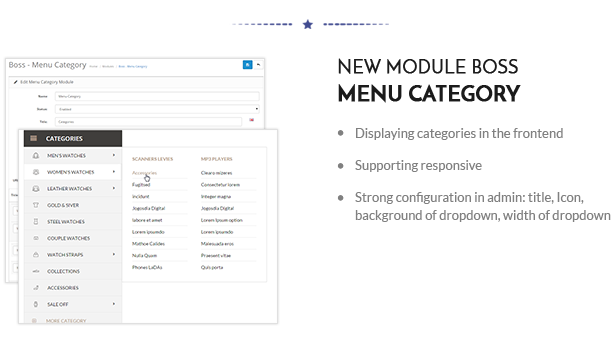 Various features are added in this theme such as fully responsive, tab slider products, fabulous icon fonts, mega menu, advanced setting module and others. Besides, Home Kids Fashion also contains new header layout for you to diversify the site appearance. Plenty of commonly icons are free, easy to use and frequently updated for the best appearance of your site. 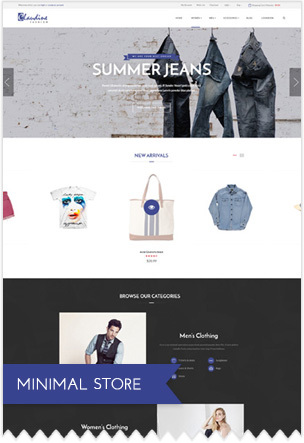 See demo here to know youâ€™re right with Claudine Kids Fashion Responsive OpenCart Theme. Bossthemes proudly introduce the whole new idea of open-source Ecommerce solution â€“ Glmobiles, shop your own way. In terms of apprearence, Bossthemes Glmobiles definitely can impresses all visitors. Every blocks, content, and details in layout are arranged in the right places. A well-organized design creates a comfortable environment for customers to easily shop. Besides a colorful, eye-catchy background, Glmobile template contains many powerful features that you cannot miss out. And the first feature to mention is Category product that allows customers to choose to shop by Best Seller, Category or Top Brand. It gets directly to what they want and need. Secondly, this is a design with Responsive Web design (RWD) feature which allows your website to automatically fit into all the device screen sizes. No more broken images, no text error even when customers surf the site on PCs, tablets or mobile phones. Moreover, new and interesting modules were developed in order to serve customers better. 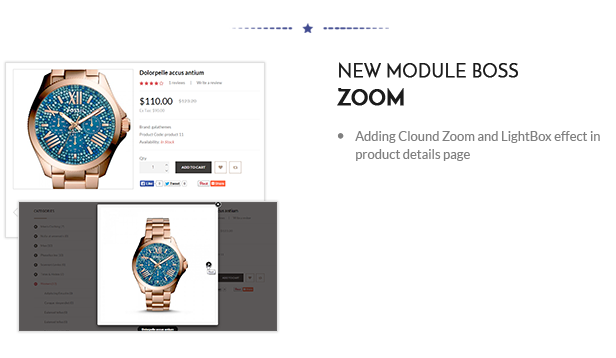 Boss Zoom, for instance, allows cloud zoom and colorbox used simultaneously. Boss Tag cloud provides a quick view of product. Discover more features below! Claudine Home Furniture is an innovative Opencart theme as a perfect choice for establishing a modern online furniture shop, gift store or a derco store, fashion shop. This new powerful and modern Opencart with clean design will attract any customer. you can easily customize the theme on personal ideas thanks to friendly user back-end controller. Merchant management and transaction will become more convenient due to powerful features such as add-to-cart, check-out page, language and currency and so on. Certainly you will fall in love with Claudine Home Furniture at first sight. Claudine Minimal ResponsiveÂ OpenCart ThemeÂ is the ultimate and premium Opencart theme ranked as a high-class store with powerful features integrated that will give you the control over your business. With minimalist,Â different styles, unlimited colors and various fonts, you can turn your dream of building a store into reality after few minutes. In addition, the template is not only visually appealing, but also uses the newest trends in coding to become 100% responsive on different screen resolutions. Moreover, you can arrange massive number of products in mega menu easily and logically so that customers can reach any item quickly and conveniently. Why donâ€™t install this Minimalist theme now? !